October was National Breast Cancer Awareness Month, an annual campaign that increases awareness of breast cancer, which affects approximately one in eight women in the U.S. According to the American Cancer Society, there have been an estimated 232,570 new invasive breast cancer cases in 2014. Even though Breast Cancer Awareness Month is over, there is no question that the cause is important year round. For us here at Doctors Health Press, that begins with sharing our cancer prevention tips with our readers. Cow’s milk is designed to help baby cows grow, and human breast tissue is actually sensitive to dairy. Farmers will also milk pregnant cows, which contain greater concentrations of natural estrogens. Many cows are also given hormones, and human breast tissue becomes sensitive to any dairy product. The cows are also fed grains with pesticides, which mimic estrogens. In fact, one study found a negative trend between the rise of milk consumption and the rate of breast cancer incidence. The study observed 48,844 premenopausal Norwegian women, and there were a total of 317 breast cancer cases. Women drinking more than three glasses of milk daily have a higher breast cancer incidence rate than non-milk drinkers, so it’s best to limit your milk consumption. Almost all processed food contains large amounts of sugar, which makes sugar hard to avoid. 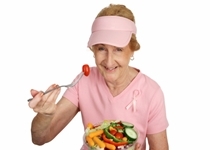 Breast cancer prevention is difficult with a steady consumption of processed and sugary foods. Sugar helps feed and enlarge cancer. The reduction of sugar would deprive breast cancer cells, and therefore the disease, according to a groundbreaking study published in the Journal of Clinical Investigation early this year. Sugary foods aren’t the only issue. How foods like wheat products, oats, and starches break down inside your body is also a concern. These foods turn into sugar in your bloodstream, which also feeds cancer cells. It is best to reduce your sugar intake and increase your vegetable intake. You should also limit natural sugars, such as honey or agave. Wheat is known to be the primary source of gluten, which can be found in many products, sweets, and desserts. Many people with Celiac disease avoid gluten; however, gluten in general can negatively affect many more, and it can indirectly increase your risk of cancer. Gluten consumption can lead to gut inflammation, which impacts your immune system. An unbalanced immune response can increase the risk of any type of cancer. It definitely matters what type of meat you consume, especially when your breast cancer risk is on the line. There are pesticides within the fat of grain-fed animals; it is best to consume meats from grass-fed animals. The reduction of meat consumption, especially limiting red meat, can also help to prevent breast cancer. Fat also plays a factor. Trans fats are known to raise inflammation in the body. It’s also best to stay away from vegetable oils and fried foods. Good sources of fats include olive oil, coconut oil, and avocados. Reducing or avoiding certain foods is a good place to start. What about natural dietary treatments? Key supplementation should include vitamin D and selenium. Also, think about the brassica family, which includes vegetables such as broccoli, cauliflower, kale, and cabbage. Your breast cancer prevention diet should also include green tea, garlic, olive oil, and other sources of omega 3 fatty acids. Murray, M., et al., The Encyclopedia of Natural Medicine (New York: Atria Paperback, 2012), 356–366. Castellanos, M.M., “Beyond ‘Pink’: How To Decrease Breast Cancer Risk Naturally,” GreenMedInfo web site, October 6, 2014; http://www.greenmedinfo.com/blog/beyond-pink-how-decrease-breast-cancer-risk-naturally. Hjartaker, A., et al., “Childhood and adult milk consumption and risk of premenopausal breast cancer in a cohort of 48,844 women – the Norwegian women and cancer study,” International Journal of Cancer September 2001; 93(6): 888–893. Onodera, Y., et al., “Increased sugar uptake promotes oncogenesis via EPAC/RAP1 and O-GlcNAc pathways,” The Journal of Clinical Investigation January 2, 2014; 124(1): 367–384, doi: 10.1172/JC163146. “How many women get breast cancer?” American Cancer Society web site; http://www.cancer.org/cancer/breastcancer/overviewguide/breast-cancer-overview-key-statistics, last accessed October 29, 2014. “U.S. Breast Cancer Statistics,” BreastCancer.org web site; http://www.breastcancer.org/symptoms/understand_bc/statistics, last modified September 20, 2014.